The owners of this beautiful home were looking for professional fabricators and tile installers in Nelson County, Virginia. With a variety of projects to plan, they were happy to learn Artistic Stone Design could accommodate all their needs, including custom vanity top and countertop fabrication and the installation of shower walls, floors, and outdoor stone applications such as a patio floor, a fireplace surround, and more. 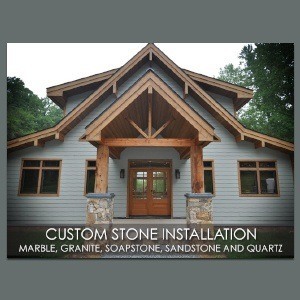 We installed granite, soapstone, marble, sandstone and quartz throughout the home, both interior and exterior. We usually service the Richmond area, but travel to accommodate the needs of customers with more extensive work. This job site was a couple of hours away. Some of the applications were outside and could not be done in cold, rain or snow. We did interior work when exterior work was not possible, and vice versa, in order to complete all the work in a timely manner. Another challenge was figuring out what sizes to cut the slabs for the floors in the foyer and the screened-in patio. Both the foyer and the patio had five different custom tile sizes cut from five natural stone slabs. We can achieve many different types of unique finishes for kitchen countertops, bathroom vanity tops, floors, walls, and more, depending on the preference of the customer. Most of the materials we installed in this home were honed to a soft matte finish or leathered finish, giving the home an elegant, yet lived-in and cozy atmosphere — an appropriate decor choice to compliment the rural charm of the home’s location. Some of the soapstone was waxed, and some was not, depending on intended use. We also generously applied our fifteen-year sealer to protect the stone and inhibit staining. The natural stone water tables and chimney caps were unusual requests, but with our expertise and extensive experience, not a problem at all. The homeowners were very pleased with all the work. We take pride in providing impressive results. To view all the images of this job, click here. Artistic Stone Design provides natural stone fabrication and installation services for kitchen counters, bathrooms, fire features, outdoor spaces, and more throughout the Richmond area. Contact us online or call (804) 594-7069 today for a free estimate.